Laugh With the Moon by Shana Burg. Grades 5-8. Delacorte, June 2012. 245 pages. Reviewed from ARC snagged at ALA. Yes, Malawi. After Clare's mother died, her dad decided to join the Global Health project and work in a tiny village in Malawi for two months... and take 13-year-old Clare with him. Grieving for her mom, missing everything about home, Clare has no choice but to try to make the best of this trip. She'll make new friends, learn a new language, and in dealing with another tragedy, she'll learn to laugh with the moon. 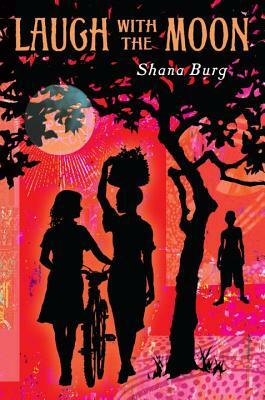 Based on tons of research and her own experiences with schools in Malawi, Shana Burg has crafted a novel that takes the reader across the globe and into an African village. She's expertly rendered the sights, sounds, and tastes of Malawi. This is a great middle-grade novel. Clare is a perfectly realistic just-turned-13-year-old: seeming too mature and worldly one moment and then too childish in the next moment. Of course Clare misses her friends and her school and her possessions, but she's also caught up in the overwhelming grief of missing her mother. Although I didn't feel like I ever had a really strong connection with Clare personally, I think the portrayal of grief was spot-on. Clare didn't have a particularly strong voice, but that's not something that I necessarily missed as I was reading. There's a lot going on and the writing concentrates on Clare's experiences with a new culture and also venturing into this new territory of not having a living mother. The details about Clare's experiences in Malawi, dealing with the stuff that any thirteen-year-old deals with (school, friends, enemies, family) while also submerged in a completely foreign culture, are what stick with me. Even weeks after reading the book, I can recall some of the details of Clare's Malawian village very well, almost as if I'd visited the place myself. I'd definitely recommend this one to armchair travelers. Hand it to fans of Grace Lin's Where the Mountain Meets the Moon, Lauren St. John's The White Giraffe, or Silas House's Same Sun Here. Laugh With the Moon is on shelves now. Will I See You at CYPD? I love booktalking. That is all.